← The Sixth Extinction II: Amor Fati 7×4: Don’t be so dramatic. Hungry 7×1: I don’t believe in monsters. Leave it to Vince Gilligan to give us a mutant with an eating disorder. I swear, I don’t know how I watched unaware of these patterns back in the day, but this rewatch has gotten to the point where I can think ahead to episodes I haven’t even rewatched yet, the credits of which I’ve never before paid attention to, and successfully match up the writer to the story. Their signatures are that distinctive sometimes and Vince Gilligan is by far the quirkiest of them all. (Love you, Vince.) In “Hungry” he gives us something that The X-Files has been threatening to give us since “Leonard Betts” (4×5): A Monster of the Week episode from the Monster’s point of view. “Leonard Betts” was the first episode to show us a reluctant mutant, with the camera occasionally choosing to follow the eponymous monster and his story instead of Mulder and Scully. Later on, “Terms of Endearment” (6×6) would half-heartedly attempt to make its audience identify with villain Wayne Weinseider. But the episode’s perspective waffled too much between Wayne’s point of view and, well, everyone else’s. That schizophrenia made it less successful than it could have been. Combine the reluctant killer of “Leonard Betts” with the decisive camera perspective that “Terms of Endearment” was looking for and voila, “Hungry”. I have to take my proverbial hat off to Chad Donnella of the charming voice crack for being able to carry this episode all on his skinny shoulders as Rob Roberts. That’s a hard enough job when the fill-ins for Mulder and Scully are familiar and beloved characters like Skinner or the Lone Gunmen or even the Cigarette-Smoking Man. “Travelers” (5×15) is largely ignored by fans for daring to replace Mulder with his spiritual progenitor, Arthur Dales. For a stranger and a villain to fully take over the role of protagonist is unprecedented on this show and Donnella does a great job. I wonder if it’s merely a coincidence that he goes on to star in famous X-Files alumns Morgan and Wong’s Final Destination. Hmm. And I must say, maybe it’s because of Vince Gilligan’s now infamous skill when it comes to characterization, but probably the best thing about this episode is how recognizable Mulder and Scully are even when viewing them from the outside. I get a smug satisfaction from being able to tell what they’re thinking, and successfully surmise what kind of conversations they’ve been having at the coroner’s office based purely on their expressions. If Season 7 has an angle, it’s that it openly celebrates the glorious routine of Mulder and Scully’s partnership. “Hungry” starts that trend in a quiet way by highlighting how by the numbers their investigations have become, and well it should because routine has its own charm. Speaking of the way we see Mulder and Scully, I’ve never appreciated how frightening it must be to be on the wrong side of them. Mulder especially is more than a little intimidating and the camera highlights that fact. For instance, there’s a great moment in Rob’s apartment building when Mulder and Scully seem to gang up on him from either side of the stairs, one above and one below him. It has the effect of watching two Jack the Rippers slowly advance toward you – there’s no escape. And later on in the scene where Mulder and Scully interrogate Rob Roberts they’re shot from right over Roberts’ shoulder. I don’t know if we’ve ever seen both of them, in the same shot, head on like that before. It’s almost startling to see them so clearly from someone else’s point of view. Usually the audience is more of a fly on the wall, that is if we’re not seeing things clearly from Mulder and/or Scully’s perspective, so this is a fun departure for me. I quite like this episode, but I can’t seem to love it as much as I do respect its uniqueness. Despite this episode’s best intentions and my best attempts to stay open minded, fifteen minutes into the action and the inevitable always happens. I can’t help it. I miss Mulder and Scully. I said above that Chad Donnella carries this episode well and I meant that but… I still miss them. Really, The X-Files is just doing what it’s done for the last couple of seasons right after an emotional season premiere – it takes a step back from the Mulder and Scully dynamic, possibly to give the audience a breather. Since Season 5, we usually have to wait a couple of episodes until we get a sort of emotional coda to the events of the premiere. Season 5 it was “Detour” (5×4), Season 6 it was “Triangle” (6×3), and this season it’ll be “Millennium” (7×5). Me, personally, I don’t need a breather. Go ahead and suffocate me with Fangirl emotion. Still, my viewing of “Hungry” would work out perfectly if not for one thing. Maybe if I could I could fully sympathize with Rob Roberts the way I’m supposed to. Maybe if he had shown enough control not to kill Sylvia, or even if he had struggled with it more, if he had cried right before he killed her instead of looking determined and unapologetic. Maybe then I could have felt bad for him when he died and I could love “Hungry” the way I want to. Everyone he kills previous to Sylvia is a jerk so I don’t begrudge him those moral lapses. But Sylvia was warm, friendly, and relatively helpless. Outside of the therapist, she’s the only person we see show Rob some genuine kindness. And whereas the therapist is somewhat vapid in her Hallmark Card sweetness, Sylvia is engaging and somewhat vulnerable thanks to that hilarious little snippet she shares about her ex-husband. After that last kill, I agree with Mulder and with Rob himself. He can’t help himself. He has to go. Ostensibly, this episode’s message is that you can’t be something you’re not. Ostensibly. Rob Roberts is what he is and nothing can change that. This makes Mulder almost villainous in his determination to stop this man who’s only following nature’s orders. Yet in the end, doesn’t Rob prove that he’s more than merely his biological drive with his dying act, his suicide by cop? Whatever his instincts, his conscience, his humanity is what won out, causing him to prefer death to fighting a losing battle against his impulses. It’s more honorable to die a righteous man than live to be an evil one, right? If your eye causes you to sin, pluck it out. Better to enter heaven with one eye than sink down to hell with both. Rob’s death is ultimately an act of self-control, ironically a character trait he’d been desperately seeking this entire episode. And if we do have sympathy for Rob, it’s for this reason. If he had accepted who he was from the beginning and relished his killer instinct a la Tooms, we wouldn’t be able to identify with him at all. “You can’t fight Bi-o-lo-gy,” he says. But it’s Bi-o-lo-gy he overcomes in the end. I guess after all he’s his own man, and he controls everything he does. I don’t know how it took me so many years to recognize this dude, but this rewatch my subconscious just wouldn’t let go until I Googled. The actor who plays Donald Pankow, the customer service nightmare who’s killed in the teaser, is Chase Hampton formerly of The Party fame. I know I’m not the only one here who was watching The All New Mickey Mouse Club back in the day. MMC like what. Speaking of the teaser, this is one of my favorite openers of the season. I love that creepy Lucky Boy mascot. Mulder’s intuition is in overdrive… again. A proboscis? Really? I know I don’t usually go there, but Scully looks amazing this episode. I’m digging the longer hair after all this time. It makes me feel nostalgic for Season 3 Scully. Meanwhile, does Scully always look this bored? Wouldn’t there have been surveillance cameras that captured the entire attack at Lucky Boy’s? If Mulder knows Rob Roberts is the killer and he knows he kills out of compulsion, why in the heck does he keep putting himself in a position to be alone with him? Has Mulder gotten that cocky? I know he baited Tooms back in “Tooms” (1×20) but that was in public, not it the privacy of the killer’s apartment where he could take you without anyone seeing. How much blood could Rob Roberts possibly have gotten on that shirt? Mulder: What if this man’s brain was eaten? It’s not sociologically unheard of. There are certain tribes in New Guinea that consider human brains a delicacy. Scully: Yeah, but Mulder, we’re in Orange County. Mulder: Yeah, what’s your point? Mulder: Oh. Hello. Look at this. Does that look like blood to you? Scully: Yes, looks like it. Mulder: What is that? Next to it. Is that, uh… oh my… ugh. Is that brain? Is that brain matter there? Scully: No, I’d say that’s ground beef. Derwood Spinks: Uh, since this is farewell, when nobody was looking… I used to dip my boys in the cole slaw. Bon appetit! Rob Roberts: I’m sorry, but this is like good cop… insane cop. Rob Roberts: I, I guess it’s the taste I respond to the most, salty and juicy… kind of buttery. The, the texture of it inside of your mouth… You know you, your teeth just sink into it like this juicy cloud, and it tastes so good you don’t, you don’t even want to swallow it. You just want to work it around your taste buds until your eyes roll right back into your head… Anyway, it’s a real problem. Sylvia: He said I was too fat to ride in his sports car, that I’d just mess up the springs. So, I sat on the hood and I bounced. And I didn’t stop until the police showed up. This entry was posted in Uncategorized and tagged Detour, Hungry, Leonard Betts, Millennium, Terms of Endearment, Tooms, Travelers, Triangle. Bookmark the permalink. I like Hungry a lot and it fits in wonderfully with Gilligan’s other tales of looking at the human side of the monsters that populate this show. PS-I realise I have a lot of reviews to comment on, and to write myself actually, apologies for not doing so the last two weeks, things were a little busy, shall we say, for me. Normal service has hopefully resumed. Meh. Hungry was okay. Annoyed that Mulder/Scully were in about 1% of this episode. Didn’t think it was a strong enough story to be fine with no M/S. I hope you got a head start ’cause those DD fans are fast. You’re right, Scully did look bored. In my re-watch, I just skipped thru to the M/S scenes, so it didn’t take long. In the final scene where Mulder shoots Rob, why didn’t Scully fire her gun? You would think that if your partner was in danger, you would want to protect him. Yes!!! I wondered why Mulder was the only one who shot. And thank you for validating my feeling. I know Scully usually looks serious. But she’s looking downright uninterested lately. Just stumbled on this blog and love it! Read this comment, watched that part of the episode and had to laugh. Not only does Scully NOT shoot, she is the one who SHOULD have shot; as the camera zooms out, Rob is directly in between Mulder and the doctor/psychologist whoever that lady is. Rule number 3, Mulder… Always know your target, and what is beyond it. Tsk Tsk. Anyway, thanks for the great blog and I will definitely be reading into the new season! Well, you’re certainly welcome here! Oh come on, this deserved at least an A-, if not an A or A+. You’re too jaded from your MSR crap to appreciate a good MotW episode. The fact this remains a memorable episode after years of not watching the show is testament to its quality. And surely this will convince me to abandon my opinion. Are you really reminiscing about a TMNT romance after berating X-Files fans for gushing over Mulder and Scully? Really?! In your last episode review you mentioned the Touchstone ‘vows’… and that a wedding night was impending. As you said above, for me their dynamic seemed so intense from the outside: now we can see where the Rain Man-esque ‘reallys?’ come from. My money is on by this point the characters have started a physical relationship- like you said in your last review. Okay, so firstly, never made the biological-imperative connection between Rob Roberts and Tooms before. Of course. Secondly, poor Gloria. I actually referenced in my blog: http://junkieintheattic.wordpress.com/2014/01/04/the-x-files-1993-2002-reopened-13-episodes/ , her’s being one of the cruellest deaths of the show. Thirdly, no way man (or girl) – you gave this the same rating as “Rush”. Now THAT was an emotionless episode; those characters were vapid stereotypes like you said. Here in “Hungry” we have an interesting monster (not to mention wonderfully acted), as well as Mulder doing the Columbo shtick. 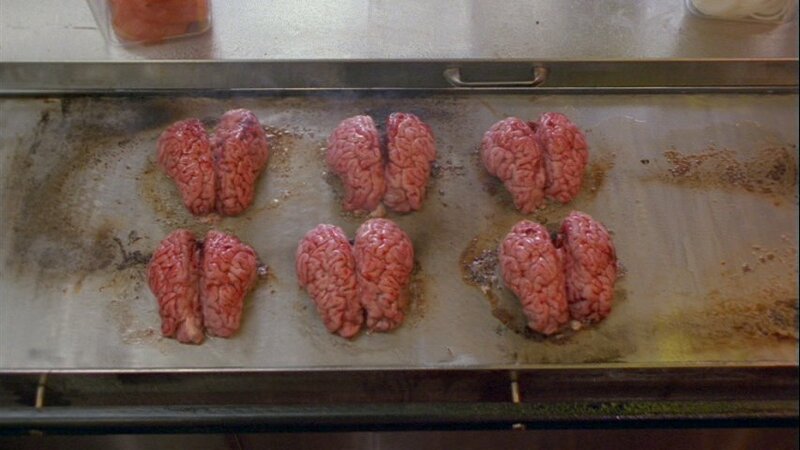 I would (and have indicated briefly in my blog) call “Hungry” one of the most important episodes of The X-Files. The best parts of this episode was the decision to make Rob the focus..the protagonist as you say. Rare indeed. I really liked the makeup done on Rob as well. Looking and acting like that while providing this meek little boy/man image was entertaining and effective. I thought DD was more engaged but then GA had little to do or say..
Yeah… and this was the season Scully developed that “bored” look. But I have to give them credit for committing to an idea that was new and different. I’m also guessing it was a challenge for DD and GA to act Mulder and Scully’s typical thought process without direct dialogue to fall back on. The unveiling of the true look of Rob Roberts – a throwback to David Bowie / Thomas Newton in The Man Who Fell To Earth movie? I’ve seen this episode a number of times before I rewatched it now. Although I wasn’t particularly looking forward to it because of the lack of Mulder and Scully, I did find myself getting sucked into Rob’s story, and emphasising with him and his plight. It’s a good angle to take on the monster story but not something completely new for the series. Leonard Betts comes to mind where the monster can’t help himself. The episode feels somewhat like a stopgap, due to limited availability of DD and GA, although I feel it was done well. Rob licking his finger reminded me of Tooms doing the same after picking up a dead rat. I noticed Rob’s next door neighbor had a wreath on her front door. Was this set around Christmas? The private dectective in the car watching Robs apartment, I’m sure is DD stand in on the show. One thing for me that detracts from the episode is the whole look and feel of it. It’s bright. This for the first time feels like the show cannot be bothered to hide the fact they are in California. It’s even set in California. Unfortunately this seems to be the case for a lot of season 7 episodes.